What will the future of trade shows look like then? Think experience meets relationship-building, or essentially, engagement marketing. Engagement marketing is where consumers are invited and encouraged to participate and actively engage with a brand through an experience. 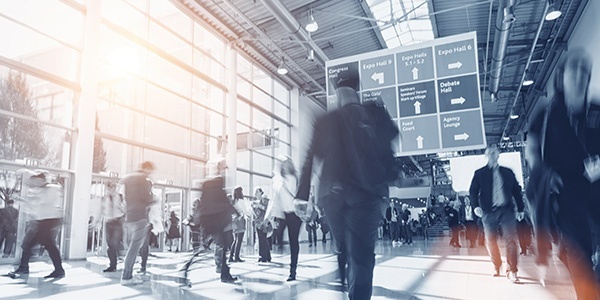 When it’s cleverly employed at trade shows, engagement marketing creates powerful, one-on-one connections with consumers — not quite the highlighter-stylus-swiss-army-knife tchotchke that your marketing team dreamt up last year. I’ve written before about the future of trade shows and lessons learned at the NAHB International Home Builders’ Show. In order for exhibitors to succeed, manufacturers must forget the bag and lose the tchotchkes. Today’s trade show booth needs to be a destination, a place for visitors to stay, find answers and participate in experiences that deliver value. Booths designed to problem-solve. Imagine, a la Apple’s Genius Bar, booths that helped attendees maximize their visit by understanding their needs. You’ll see experts, skilled at quickly comprehending and responding to builder issues, greeting attendees at the front of the booth, scheduling “check-ups,” and ascertaining customized ways to help. Imagine how much richer a product demonstration could be if contextualized with the exact problem a builder wants to solve. Immersive storytelling. Expect even more augmented and virtual reality experiences, and brands incorporating everything from 360° video content, face and gesture recognition, 3D mapping/printing, wearable technologies and more into their exhibits. You might see a paint manufacturer offering an app that assists in color selection by allowing you to virtually paint a wall, or an insulation manufacturer offering builders an opportunity through VR goggles to understand and strip away the layers of a wall system. Tailored communication strategies. Today, a robust email marketing program with deployments before, during and after the trade show isn’t enough. Attendees want more than promotional items — they want personalized communication, hyper-relevant answers and experiences that make their businesses more successful. Trade shows will always be about relationship-building — make sure your digital toolkit has solutions that customize, enhance and accelerate this aspect. The trade show will always be an essential vehicle for driving awareness, building relationships, explaining and demonstrating the product, and cultivating qualified buyers. Make sure you’re connecting with customers in a meaningful way. Looking for more trade show marketing ideas? Contact us today.